Are you interested in starting your own podcast? To learn why you should start a podcast and what you need to know to get started, I interview Cliff Ravenscraft for this episode of the Social Media Marketing podcast. In this episode, I interview Cliff Ravenscraft, the world’s leading evangelist on podcasting and founder of Podcast Answer Man. Cliff shares his knowledge and experience of hosting many different podcasts. You’ll learn practical tips and advice you can use to start your very own podcast. Why is now a good time to start a podcast? Cliff believes that now is a great time to start a podcast. Recently, CNet reported that Apple is going to end up selling 1 billion iOS devices by 2015 and already 410 million of these devices have been sold. You’ll learn about Apple’s official Podcasts app and how this has had a very dramatic and positive impact on those podcasts that are listed in iTunes. When you visit the Apple iTunes Store, the Podcasts app is one of the first apps recommended. And in September, CNet reported that 500 million Android devices have already been activated. Cliff shares why it’s easy to get people hooked on podcasts. It only takes 5 to 10 minutes to install a free podcast app on a smartphone and it’s easy to subscribe to your first podcast. You’ll also learn some interesting numbers to note. For instance, 30 million people have a gym or a fitness club membership, and 97 million people in the USA drive to and from work every day alone in their car, with an average commute time of 26.2 minutes. Cliff believes podcasting is different than when it first came out because of the smartphone. The smartphone makes it easy for anybody to subscribe from their device. You don’t have to be technically savvy anymore. Every time people go into their app, your latest episode is going to be there for them. Listen to the show to find out more reasons to start a podcast. What are the different types of show formats? Cliff believes there is no limit to the type of podcasts that can be created. Cliff started podcasting as a hobby in the entertainment genre. He started out with the TV show Lost as a podcast, followed by fan podcasts covering the TV shows Heroes, Dr. Who, The Hunger Games, Twilight Saga and a soon-to-be-launched The Lord of the Rings podcast. These are podcasts that bring fans of existing shows together where they can share their interests with one another. You’ll discover why Cliff loves this podcast format. 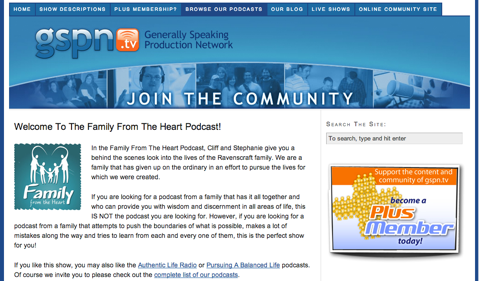 Not only does Cliff do TV show–related podcasts; he and his wife also host one called Family From the Heart. It’s a weekly show about behind the scenes with the Ravenscrafts. It’s an authentic, real-life audio show. This type of show makes Cliff feel really nervous, but people love it. The Family from the Heart podcast is hosted by Cliff and his wife. As for the Podcast Answer Man show, it’s a show that stands out on its own. This is his brand where he teaches people about podcasting based on his experiences. Cliff has devoted more than 20,000 hours to podcasting in new media. This is double the number of hours required to become an expert, as referred to by Malcolm Gladwell. There are two shows that exist outside of Cliff’s GSPN.TV “network”: the Podcast Answer Man and the Virtual Assistant, which is similar to Podcast Answer Man in that it’s Cliff sharing his experience and knowledge about becoming an expert in a field. Listen to the show to hear the format behind Cliff’s new podcast, The Lord of the Rings Fan podcast and find out more about the “sound scene tours” format. What do you need to know if you’re scared to take the leap? Cliff recommends that if you are scared of starting a podcast, then don’t start one for your business or your brand. Instead pick a hobby, something that you are extremely passionate about and start there. Amazing things happen when you start building relationships with people around the world who are just as passionate about a subject as you are. When the subject you are passionate about becomes the focus of the show, it helps take the pressure off. Listen to the show to find out how you can make it a lot less scary when starting out. What’s the most consumed type of podcast—audio or video? Cliff believes hands-down that audio is consumed the most. There are a number of popular video podcasts, but they are very few and far between. If you look through the top 10 categories on iTunes (you can sort by audio or video only), audio is certainly at the top. The reason why Cliff likes audio more than anything else is that people can listen to it just about anywhere. Human beings are able to listen and do other things at the same time, but it’s impossible to multi-task when you are watching a video. This is the key to why audio will never go away. Listen to the show to learn why audio over video is the way forward, if you want to get 20-40 minutes of content to your subscribers on a weekly basis. What’s the best show frequency? The ideal frequency depends on why you are creating the podcast and your desired outcome. If you want to remain top of mind like most marketers, Cliff believes that a weekly format is the best choice. Cliff advises against anything more than once a week, even though there are people doing it. People who subscribe to podcasts tend not to like missing an episode of your show. If they subscribe to your content, they want to consume all of it. For the last 5 years, Cliff has been doing a “litmus test” where if you go to Twitter and do a search for the phrase “behind on podcasts,” you’ll be blown away. You’ll find that within the last 48 hours, people will have been complaining about the fact that they are behind on podcasts for a specific show. Twitter search for "behind on podcasts." The main thing is to make sure you are consistent. Listen to the show to find out why Cliff would unsubscribe from a podcast rather than get behind. If you want to find out what equipment you need, head over to Cliff’s site where you’ll discover a list of each item he uses, an explanation of what they are and the reason why he chose to use them. You’ll also find a tutorial called Studio Set Up, where you can purchase a guide, Inside the Studio. 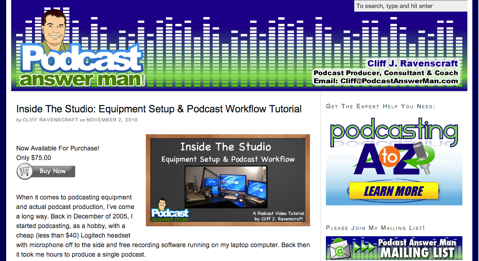 It’s a step-by-step description of how Cliff hooks up and his podcasting workflow from beginning to end. If you don’t want to buy it, you can still check out pictures of Cliff’s studio and how it has evolved over the years. Inside the Studio is a step-by-step guide to how Cliff hooks up and his podcasting workflow from beginning to end. If you want a professional-quality audio, Cliff’s advice is to make sure you invest in an audio microphone. It’s very easy to get a professional audio sound at a reasonable cost. You can start a podcast with nothing more than your built-in microphone on your iMac, but for more decent-quality audio, you can spend anything between $50-$100. At the top end for very professional quality, it can cost you around $1500. You should only buy expensive audio equipment if you are doing podcasts on a serious scale. Today, it’s important to have good audio quality because there are more and more podcasts coming out. Listen to the show to learn more about the different price options for microphones. How can you get prerecorded questions to be used in a podcast? Cliff talks at great length about prerecorded questions in one of his blog posts. Cliff's blog post, Voice Mail for Podcasters, is an excellent resource for discovering how to use prerecorded questions. A voicemail feedback telephone number that you can call 24/7. Cliff receives an audio file via email whenever a caller leaves him a voicemail. He uses software called SpeakPipe. 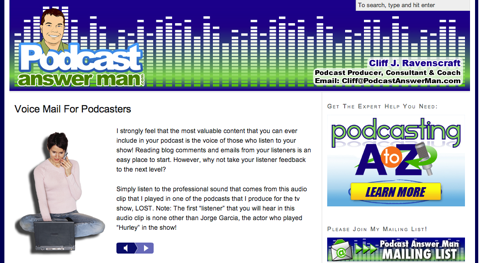 Other podcasters can send in super high-quality audio and attach it as an MP3 file in an email. You can record a message using voice memo software on your iPhone or Android device and then send it in. Listen to the show to discover more about how SpeakPipe works. We have installed an awesome new function at Social Media Examiner for this podcast. It’s a voicemail feedback. 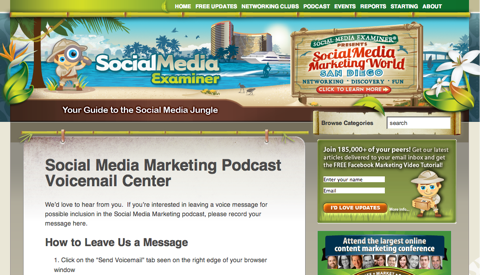 Using Social Media Marketing Podcast Voicemail Center is a great way to leave a question for the show. Do you have a question about content marketing, blogging, social media marketing or podcasting? You can now leave a voicemail here. It’s easy and uses the microphone on your computer. I’ll then select the questions to answer in an upcoming show. You’ll have an opportunity to mention your website and your company and we will cross-link that information back into the show notes. It’s a great opportunity for you to make it onto our podcast. We have about 18,000 people who listen to this podcast every single week. Listen to the show to learn more and let us know if you give it a try. Check out this amazing new video showcasing all the event has to offer PLUS you can save $300 if you register by Dec. 31st. What do you think? What are your thoughts on starting your own podcasting show? Please leave your comments below.